We would like to share our story with you. We sincerely feel that it will improve the quality and comfort of your life. sleep position is on one’s back. Nowhere could we find a pillow designed to be comfortable that could also maintain a back-sleeping position while supporting the lower back and neck. We also couldn’t find a comfortable pillow that keeps the head in a face-up position to help minimize and prevent facial wrinkles. We are dedicated to the promise of promoting life long habits of health, wellness and beauty—no matter what your age or health is today. We are committed to not only your well-being and beauty, but also to making products using the highest quality materials: hypoallergenic, moisture-wicking, and able to be machine washed and dried. Our product is all of these things, plus it is manufactured in the USA. We invite you to try the most comfortable , highest quality, easiest to use back-sleeping pillow on the market today and to be part of the CosMedComfort family. 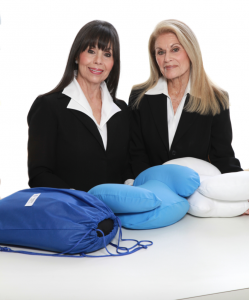 We hope you will love the CosMedComfort Pillow as much as we, and all of our customers do!